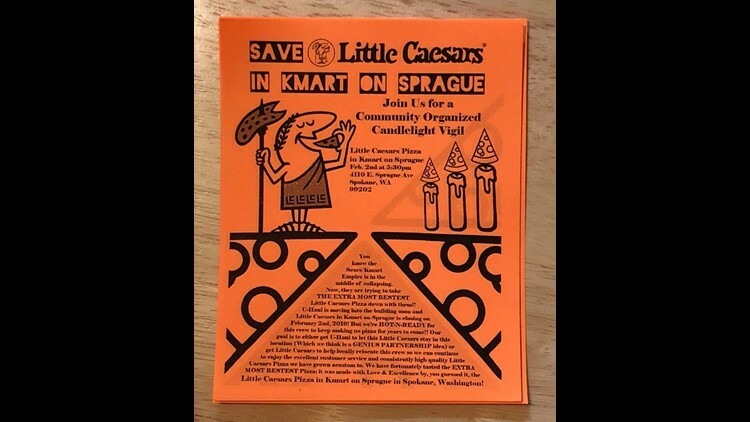 Eric Hennies launched a campaign on Facebook to save the pizza franchise located on Sprague Ave.
SPOKANE, Wash. — The Kmart on Sprague is closing and with it so is the Little Caesars Pizza. U-Haul is planning on taking over the lease and moving into the building. But one man doesn’t want to lose his Hot-N-Ready pizza. Eric Hennies launched a campaign on Facebook to save the pizza franchise located on E. Sprague Avenue. "I saw it on the news and I was like, 'No, Little Caesars, you're going to be gone! Where am I going to get my pizza? Where am I going to get my hot-n-readies?' And I think it was probably later that day or the day after that I started the Facebook page, 'Save Little Caesars,'" Hennies said. 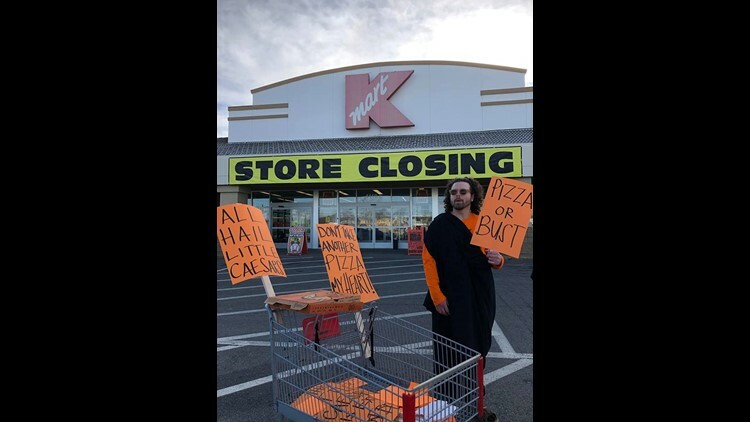 He and other supporters were out in the parking lot Tuesday, handing out free pizza and flyers for a candlelight vigil at the location on Sprague at 5:30 p.m. on Feb. 2, the store's last day of operation. Hennies, who was wearing a toga when he spoke to Krem 2 News, is also leading what he calls a "21-day Pizza Salute" in honor of the store. "A Little Caesars has been my savior," Hennies said. "When I'm working 15-hour days, what am I going to do? Go home and make a pizza for two hours, go home and sleep for four, and go back to work for another 15? No, I can't do that. I'm broke. Where else am I going to go? I gotta go to Little Caesars." Hennies explained Little Caesars is "on-point every time." "I don't have ratio problems here," he said. "The ratio is always right. My dough is in a circle, my sauce is in a slightly smaller circle, my cheese is in a slightly smaller circle, just the way pizza should be." Hennies hopes to get the district manager to re-franchise the Little Caesars and buy a different location for his beloved store.